Hawaii's Supreme Court OKs Construction Of Giant Telescope Despite Native Objections The massive telescope with a nearly 100-foot mirror is set to be built atop 13,800-foot Mauna Kea, considered sacred land by some of the project's opponents. Telescopes on the summit of Mauna Kea on Hawaii's Big Island. Some native Hawaiians consider Mauna Kea sacred and object to construction of a new giant telescope there. Hawaii's Supreme Court has sided with scientists in a battle to build one of the world's largest telescopes, rejecting efforts by native Hawaiians to block its construction atop what some consider a sacred volcano. In 2015, a construction permit for the Thirty Meter Telescope, or TMT, to be built on Mauna Kea, was invalidated amid protests and court appeals, claiming the dormant volcano is sacred land that would be violated in the building process. However, in a 4-1 ruling on Tuesday, the Supreme Court of the State of Hawaii upheld the construction permit for the telescope, with its massive 30-meter (98-foot) primary mirror made up of hundreds of smaller segments. According to court documents, "Native Hawaiian cultural practitioners believe that Mauna Kea, as a sacred manifestation of their ancestry, should be honored in its natural state and is desecrated by development of astronomy facilities near its summit," while the scientists argued "that telescope use is an allowed and appropriate use of the summit area, that various measures are being taken to reduce the impact of the TMT, and that Mauna Kea can also be honored through the advancement of scientific knowledge that TMT would provide." The remoteness of Mauna Kea, located on the Big Island, shields it from urban light pollution and the extremely dry air near its 13,803-foot summit makes it ideal for astronomy. It is already home to 13 telescopes housed at a dozen separate facilities, including the twin 10-meter (33-foot) instruments at the Keck Observatory, currently among the largest optical telescopes in the world. Backing the TMT project is an international partnership, which includes Caltech and the University of California, the National Research Council of Canada and astronomy organizations from India, China and Japan. The chair of the partnership's board of governors, Henry Yang, issued a statement following the court's decision on Tuesday. "We are excited to move forward in Hawaii and will continue to respect and follow state and county regulations, as we determine our next steps," he said. "We are deeply grateful to our many friends and supporters for their tremendous support over the years." 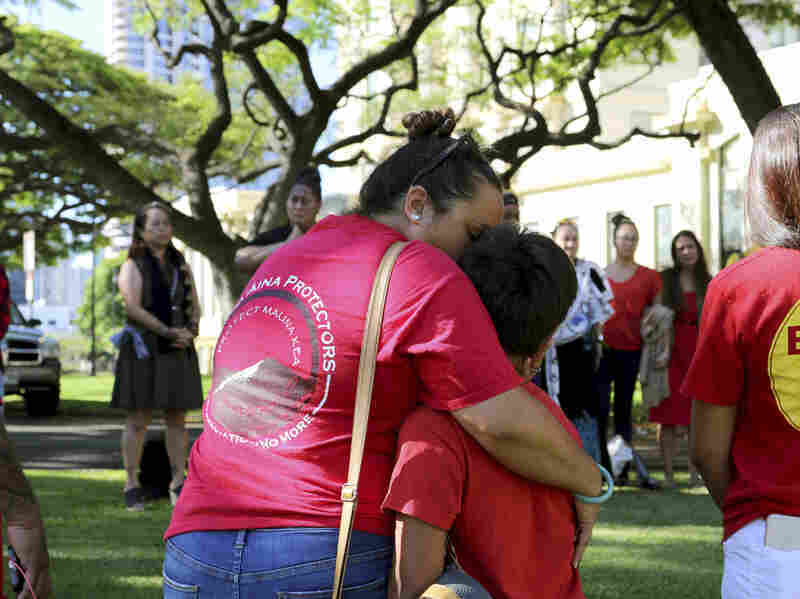 Joanna Pokipala and her son Kala Pokipala embrace while gathered with telescope protesters outside the Hawaii Supreme Court building in Honolulu in June. KAHEA, an organization for the revitalization and protection of the state's unique natural and cultural resources, said it is disappointed by the court's ruling. "Thousands of Hawaiian cultural practitioners have affirmed the sacredness of the entirety of Mauna Kea. Thousands more have supported the protection of Mauna Kea from the TMT project," the group said in a statement. "The Court's opinion has done nothing to change this," the statement continued, calling on Hawaii's Gov. David Ige and other project supporters to "put the well being of the people of Hawai`i first and to relocate their project away from Mauna Kea." "The high court reviewed thousands of pages of documents and testimony over many years, so it's difficult to imagine the monumental task the justices had in reaching this decision," Ige said. "We believe this decision is fair and right and will continue to keep Hawai'i at the forefront of astronomy." University of Hawaii President David Lassner, who backs the project, said he was also pleased by the court's decision. Tuesday's ruling is the latest in a years-long process to make the giant telescope a reality. 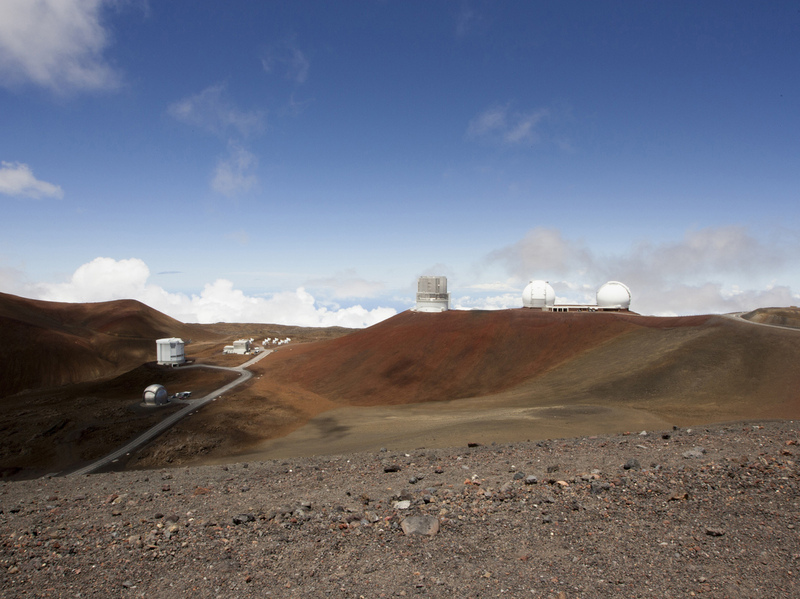 The Mauna Kea site was chosen by TMT scientists after "a rigorous five-year campaign spanning the entire globe that measured virtually every atmospheric feature that might affect the performance of the telescope," according to the group's website. Planning for the telescope began in 2009 and a permit was first issued in 2011. However, a groundbreaking ceremony was halted by protests in 2014, according to The Associated Press. Protests intensified in 2015, with 31 people arrested in April of that year for blocking a road, according to Molly Solomon of Hawaii Public Radio. A lawsuit was then filed, which lead to the state's Supreme Court invalidating the construction permit. After Tuesday's ruling, Kealoha Pisciotta, who the AP describes as one of the main leaders against the telescope, no longer thinks the legal process is viable. "The court is the last bastion in democracy," she told the AP. "The only other option is to take to the streets. If we lose the integrity of the court, then you're losing normal law and order, and the only other option is people have to rise up." With the permit being re-approved, State Department of Land and Natural Resources Chairwoman Suzanne Case told the AP the next steps involve submission and review of construction plans. The AP also reports that protesters are not planning to back down. It quotes telescope opponent Kahookahi Kanuha as saying Hawaiians should get ready for non-violent resistance.